If kitchens are the heart of the home, then KBIS is defining the way Americans live. 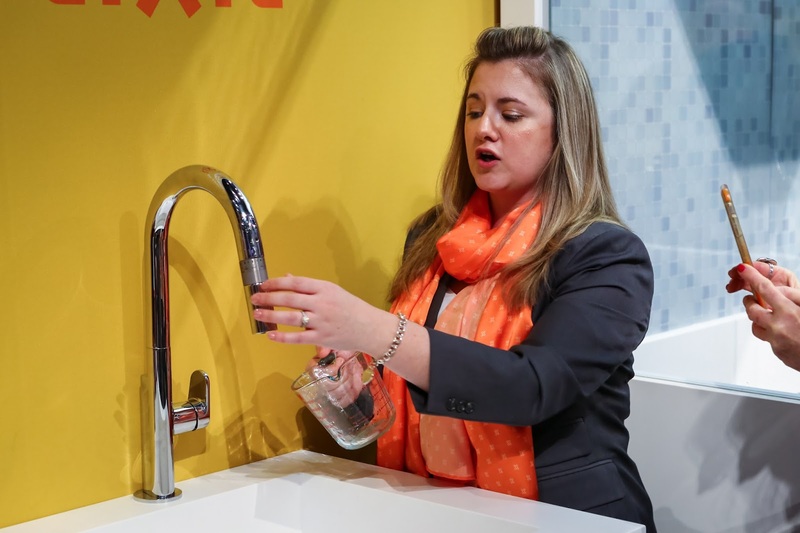 At the KBIS 2017 show, top brands showcased their concepts and innovations of every area of kitchen design. I'm seeing more and more how technology is pushing the boundaries of kitchen design and more brands are coming out with products that make your time in the kitchen more enjoyable. Brands like Thermador, Grohe, American Standard, Wilsonart and Wellborn Cabinet were showing products with personality that help you do less work, and more time to party, enjoy and hang out in your kitchen. Bring some personality and color into your kitchen too. The Grohe Essence new kitchen faucet available in April 2017 offers a nylon hose with multiple colors to choose from. 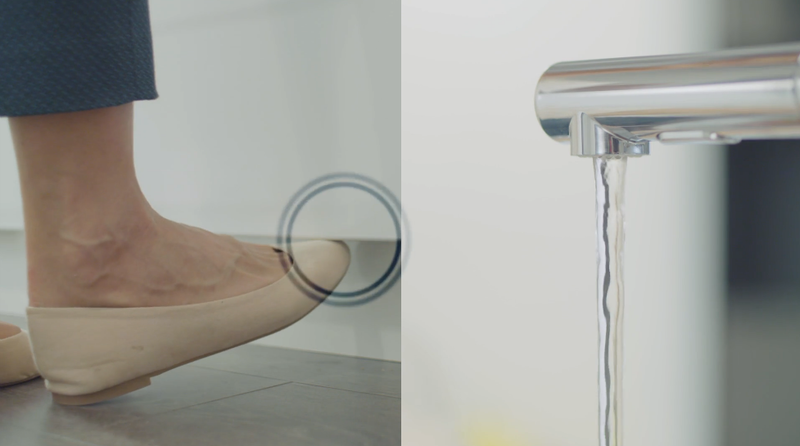 It has a comfortable spout and a dual spray faucet with a useful toggle function making it seamless to switch from spray to regular water flow. The hose is interchangeable, so get a few colors to change out for your parties! It is Thermador's ingenuity and quality craftsmanship that resonates with culinary enthusiasts. They "share the exceptional" by being committed to the cooking experience. The Thermador Culinary Preservation center fits any lifestyle offering ultimate configurations. Side by side you can build in a freezer- refrigerator combination next to towers of wine that has separate zones all built in - great home personalization making it easier for ultimate entertaining! The new Star-Sapphire dishwasher offers real dish care solutions! The flexibility to entertain is here without restriction. Their new slim top rack can fit those large spoons and cook tools that you usually have to clean by hand. They call it the entertainers drawer and it will save you time! What I'm also excited about is the blue accent of light which you can use to set a cool vibe in your kitchen. Both of these new innovations enhances the experience of entertaining. Wilsonart laminate can now rival stone head on! Wilsonart's mission is to give alternate surfacing options that provide customers with choices of design, performance and price. Their new Ultra Matte Laminate Stone finish really looks like stone. The corner engineering is unbelievable. I love stone but if you cannot afford it this laminate offers performance, scratch resistance and Antimicrobial protection. The technologies built into this laminate will make your life easier just like other solid surfaces! Wellborn Cabinet features product lines that offer cabinetry for every room for everyday living. 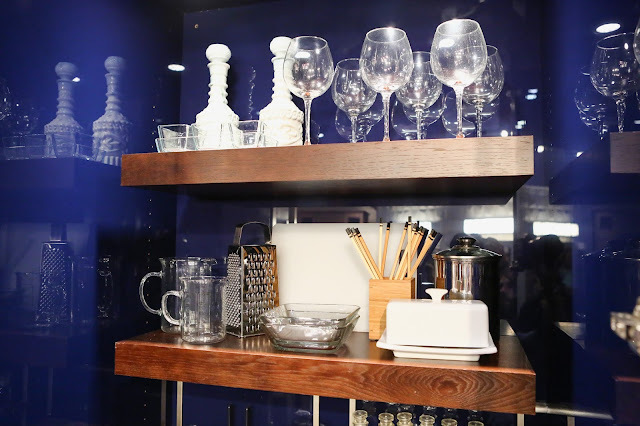 I fell in love with this modern curio cabinet that can house all of your cooking essentials and bar all in one! These kind of storage solutions help you maximize your total home living space. The interior blue was stunning against the natural wood shelving and trays! Thankyou to our BlogTourKBIS by Modenus sponsors - Thermador, Grohe, American Standard, Wilsonart and Wellborn Cabinet who offered us surprise and delight with innovative solutions for your kitchen!